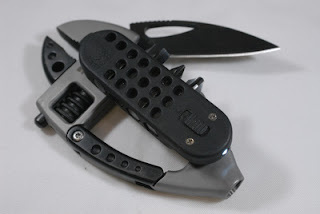 The Guppie is a futuristic multi-tool combining a knife, screwdriver, wrench, carabiner and flashlight. The wrench can open up to 1/2'' using an endless screw, it has a good grip and will work well as long as the bolt is not inside a narrow place since the tool is quite wide. The carbon knife has a thumbhole for one hand opening, it is very sharp out from the box and will be fine for most cutting jobs. The screwdriver has a bit holder with 4 different bits, it has very good torque. The bit holder is attached to the Guppie via magnets and is removable and also holds a LED flashlight, not very bright but can be helpful to find something inside a backpack or help you find a keyhole. At the other side we have a stainless steel pocket clip that can be used as a money clip if you want. The carabiner clip can be used to attach the Guppie to a belt loop, backpack strap or a d-ring, it looks strong but is, of-course, unsuitable for climbing. After opening the carabiner the end can be used as a bottle opener. The Guppie is a handy multi-tool with an interesting look and good carrying options including both a pocket clip and a carabiner. If you frequently use either a wrench or a screwdriver combined with a knife the Guppie is a nice combo to have. As many other novelty multitools the final evaluation is very subjective. You can order and read more about it in CRKT's website.